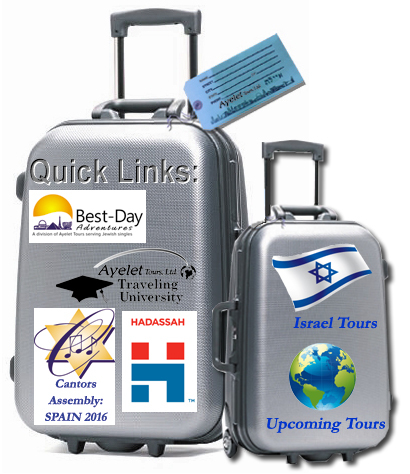 ﻿ Israel Tours, Bar Mitzvah Tours, Holy Land Tours & More - Tour to Israel Here! and Tours around the Jewish World! Explore Israel with Ayelet Tours! Welcome to the Ayelet Tours Family! Since our founding in 1986, Ayelet Tours has strived to create unparalleled tour experiences with a personal touch on both our Israel tours and our Jewish Heritage tours around the world. We look forward to helping you “Make the Journey Yours”! What makes a tour to Israel with Ayelet Tours more than just a vacation? Passion. At Ayelet Tours, we have a passion for the land of Israel, both for the miracle that is the modern state and for the ancient land filled with history, archaeology, religion, conflict, and spirituality. Each day at Ayelet Tours, we help travelers turn their dream of a tour to Israel into a reality. We take our role in the fulfillment of that dream seriously. A tour to Israel carries much more emotional weight than virtually any other vacation. On our Israel tours, we recognize that there is a spiritual connection and an energy that draws people to Israel from across all religious beliefs, levels of observance and nationalities. What makes an Ayelet Tours Israel itinerary unique? Balance. Our Israel tour itineraries are planned by our in-house Israel experts – incorporating decades of experience to craft a balanced tour experience. What that means for you is an Israel tour crafted to balance ancient historical and archaeological sightseeing with educational and interactive opportunities, and of course fun! From a hands-on archeological dig, to meeting with new “olim” at an absorption center; from bringing gifts to children at a trauma center, to hearing David Ben Gurion declaring Israel’s Independence in the place where it happened; from learning with preeminent scholars, to meetings with journalists and Israeli politicians - our tours to Israel delight the senses and enrich the soul. All of this happens for you under the direction of an expert guide individually selected for your group, who has the knowledge, passion and ability to transform your Israel Tour into the journey of a lifetime. What makes Ayelet’s World-Wide Traveling University unlike anything else? Experience. For decades, Ayelet Tours has created Jewish Travel experiences around the world. Our Traveling University tours cover the length and breadth of the worldwide Jewish experience – spanning across Poland, Germany, Spain, China, Argentina, Russia and beyond. Our ability to combine meaningful and enriching itineraries, top notch accommodations and authentic local cuisine, accompanied by lectures throughout by legendary Prof. Stephen Berk make our Traveling University tours the best way to experience firsthand all that the Jewish World has to offer. Join one today – the Jewish World Awaits! Find your Journey today. Explore our website, contact us by email at ayelet@ayelet.com, or call us at 1-800-237-1517.